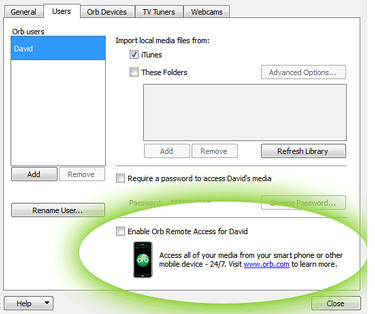 Orb Live enables you to access your media collection, get live TV on the internet or internet tv streams on your home computer from your smart phone, iPad or iPod touch. Orb Live is great if you have the patience to set it up. We looked closely at setting up on a PC and the steps proved to be cumbersome. Orb's website says it's easy to set up with these steps: Download the software to your pc and set up the software and launch the Orb Control panel and make sure iTunes is selected or folders that hold your media. You need to purchase a tuner. WinTV HVR-950 BDA Capture or WinTV HVR-950 Capture. The device can be found for about 65 to 85 dollars. Amazon.com usually has good prices on used items like this. Once your tuner has been found in the list you can start the wizard to set up your tv. Be sure to choose Enable Orb Remote Access before moving to the second step. After going through the set up wizard your smart device should be able to start streaming through your WIFI signal. The images will actually be streaming from the server that is set up on your computer to your smart device.